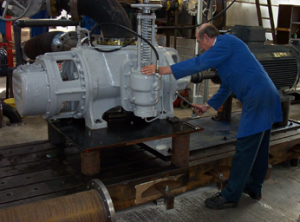 Every gear pump, screw pump or lobe pump manufactured by Albany is tested in our in house testing facility to ensure compliance with customer requirements. We have developed a sophisticated facility for our own products and can test from sub kilowatt to 200 kilowatt with variable speed drives, and use mostly digital equipment to measure pressure, flow and temperature of the products under test. We are carrying out tests of different conditions with different liquids everyday. We have various different viscosity oils and water on site, and sometimes test on customer’s fluids. It is common for us to be asked to test products made elsewhere, so don’t hesitate to contact us to discuss any such potential requirement.